Some hairstyles never come out of fashion. Depending on the season, they undergo some metamorphoses, but their basic line remains unchanged. They are timeless, because they emphasize woman’s personality like no others. CLASSIC BOB – fits for an oval or triangular face. This hairstyle optically rounds the face out, smooths the outline of the pointed chin. Ideal for stiff and thick hair. It will also provide hair with some downiness. This is a very feminine hairstyle, easy to arrange. It works out with all colors. LONG STRAIGHT HAIR A LA THE 1960’s – ideal hairstyle for tall women with straight and thick hair. Disadvantageous for short ladies as it optically shortens the figure. This hairstyle will slim down a round face, but it will lengthen an oval one too much. Hair of this type requires styling with a straightener, using some products that polish hair and protect it against heat. 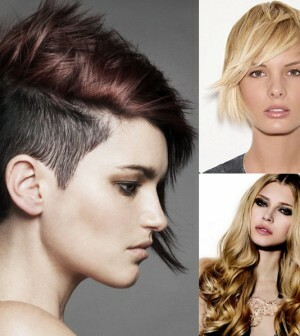 BUZZ CUT – a good hairstyle for medium height women with boyish figures. Very short hair exposes the head shape. 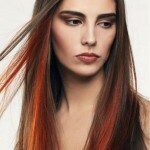 The style emphasizes face features, so if they are sharp it would be better to choose another option. Very short hair is very easy and quick to model. It looks best in a definite color, such as red, black or ginger. HOLLYWOOD WAVES – a hairstyle that emphasizes the woman’s beauty. It is good for tall women wearing clothes of classic elegance. It looks best on thick healthy hair. It fits a triangular and round face. It requires thorough styling with ruling irons, hot rollers or a big round hairbrush. PAGE – this is an ideal hairstyle for a square or rectangular face oval, as such haircut provides face features with smoothness, softens sharp outlines. Well cut page will not cause much problem while modeling. BIG FRINGE – for ladies of tall forehead and oval face. Long fringe counterbalances a long nose and protruding chin. Such forelock finely completes long, straight, half-long hair, both thick and thin. 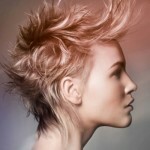 RETRO HAIRSTYLE – will emphasize the beauty of slim, petite women having delicate face features. Although it will look fine on each of us. A retro hairstyle exposes a subtle face oval. It harmonizes with an adequate dressing style. It is best for half-long hair. It requires precise modeling. Time-consuming. SHORT WITH THICK SHAG – always fashionable and suitable for all women. Short hair on the nape of the neck with longer surface strands. Ideal for every type of hair. Every color will look good with this style. Styling rather quick. ROCK STYLE – good for women fond of casual or sport styles. It looks best with an oval or triangular face and a slim, tall body figure. 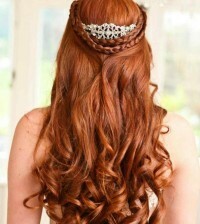 To make the hairdo arrange well, hair should be of medium length. Because this hairstyle is strongly layered, styling requires usage of gel, wax or styling paste. CHARLIE’S ANGEL – a mega-feminine hairdo. It is suitable for women of medium or tall stature. This hairstyle is appropriate for thin and normal hair. To model use curlers, rollers or a round hairbrush, rolling hair outwards. It looks good on hair with highlights.